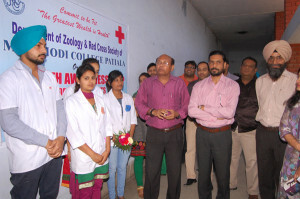 Department of Zoology and Red Cross Society of M.M.Modi college collaboratively organised a one day health awareness camp to check the health parameters such as BMI, Hb, Blood pressure, Blood group etc of the students of the college. Dr. Khushwinder Kumar, Principal, M.M. Modi college inaugurated the camp at Zoololgy Department laboratory and made the students aware of the importance of being healthy and fit. He further emphasized the need of control of diet high health standard. Dr. Vinay Jain, Dean Sciences also told the students about the healthy life style. Dr. Ashwani Sharma, Incharge Red Cross Society of college advised the students regarding the importance of regular monitoring of their health status. All physical parameters were examined by students of BSc II and III (Medical) under the supervision of Dr. Sonika Kapoor, Prof. Amit Sareen, Dr. Monita Dhiman and Dr. Henna Goyal . During this camp about 200 students of different streams were examined for above parameters. During this occasion Prof. Ved Prakash, Dr. Rajeev Sharma, Dr. Gurdeep, Prof. Sharwan, Dr. Kuldeep, Dr. Mandeep, Dr. Deewakar, Prof. Teena Pathak and entire faculty of Physics, Chemistry and Mathematics was also present.